Do you sometimes wonder what to get the person who has everything? So do I. That's why I revert to using gift cards and cash at times. It seems so cold to give a plain card with such a gift. I think it makes such a gift much more special if you make a gift out of the card at the same time. That's why I found a way to make a card wallet. You could customise this idea for men or women, young or old! Add more than gift cards - photos, notes, gift cards promising meals or cleaning or shopping, all seem to be well-received. Sponge all the edges with ink slightly darker than your cardstock. Cut a piece of acetate 2”x 3” and adhere to window. If you want to do faux stitching it is easier to do it now. Place pieces of wallet together and carefully pierce around inside pieces. Complete wallet by taping outside and bottom edges to each other ensuring you can still pop cards and notes in the pockets. Stamp ‘patch’ in spare cardstock and after doing faux stitching if you are doing it adhere to front. If you make one of these, do let me know. I really like to see the way you work! PS: Remember you can order your supplies for this project from me at SusanSalutations. 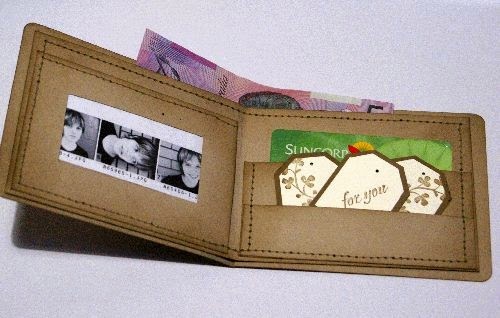 Oh Susan, I just love this wallet and will have to have a go at making it as I am more often giving money or gift cards as it is nice for the receiver to be able to choose what they would like. Thank you also for the instructions. Wonderful wallet Susan when I get home I will definitely have a go at this, you clever girl! !